Even Bank of America deserves a little credit sometimes. 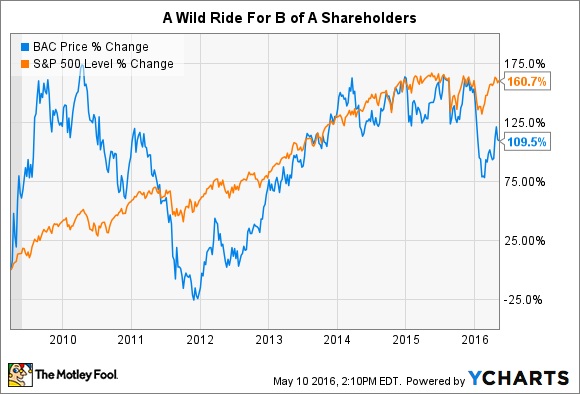 At the end of the first quarter of 2009, Bank of America (NYSE:BAC) was not in a very good place. The financial crisis was in full swing, the real estate market was in collapse, and the bank's stock had fallen over 83% over just the past year. Fast forward seven years to this year's first quarter and a lot has changed. The economy is back in the black, the stock market is pushing record highs, and Bank of America has reshaped itself into a much different organization. Here are 15 different ways that the bank has improved over the past seven years, listed in no particular order. Bank of America stock is up 109% since March 31, 2009. That's a strong improvement, even if it still trails the S&P 500's 161% increase. However, the bank's stock today is 27% below its high during this period, and remains 74% off its pre-financial crisis highs. The primary driver of the financial crisis was a deterioration in the credit quality of loans on the books at U.S. banks. As those loans fell past due, defaulted, and turned into foreclosures, the banks took increasing losses that threatened their very existence. Thankfully, today's loans are in much better shape. Bank of America's total non-performing assets have improved considerably since 2009, dropping 64% from $25.7 billion to $9.28 billion for the 2016 first quarter. Non-performing assets are severely past due loans plus foreclosures. When loans go bad, banks are required to set aside a reserve of capital to help offset potential future losses from those loans. When the bank adds to its reserves, it appears as an expense on the income statement called the provision for loan and lease losses. This provision was a major drag on earnings back in 2009, hitting Bank of America for $13.4 billion in the first quarter alone. In contrast, the first quarter's provision this year was 93% lower at $997 million. Since 2009, Bank of America has been able to drive higher revenue in some of its non-interest revenue streams, like investment and brokerage services fees. The bank generated $2.96 billion on this line for the quarter in 2009, compared to $3.18 billion in 2016. That 2016 number is particularly impressive given the tumultuous start to the year for the stock market, including the worst 10-day start to any calendar year in the S&P 500's history. Sticking with fee-driven revenue, the bank's investment banking division also put up better numbers in the 2016 first quarter compared to 2009. The group's revenue was $1.05 billion then, compared to $1.15 billion now. Interest rates have been at generational lows since the financial crisis, driving a decline in the yields banks can earn on their loans and investments. That's a challenge, but the flip side is that banks are also paying out much less in interest expenses to their depositors and creditors. Bank of America is no exception. Its interest expense was $9.7 billion in the first quarter of 2009, versus just $2.5 billion in the first quarter of 2016. In fact, B of A has reduced its interest expense by a greater percentage over this period than the reduction in its interest income. Interest income may be down 47.3%, but interest expense is at least down more, with a 74% decline. If revenue is going to decline, at least expenses are declining more! In addition to lower interest expenses, Bank of America has also successfully cut a meaningful level of operating expenses since 2009. This decline was a result of the bank's "Project New BAC" cost-cutting initiative, completed last year. That program will save the bank at least $8 billion a year in operating costs going forward. The success of the program is already seen in the first quarter's numbers. Non-interest expenses were $14.8 billion, down from $17.0 billion in the 2009 first quarter. The impact of Project New BAC can be seen further as you dive deeper into the bank's income statement. The bank's branch network is far more efficient today than it was in 2009, a result of consolidations, improved technology, and an overall simplification of the business. The bank's real estate footprint is down 34% over the last five years alone, including a reduction of over 1,000 financial centers. Total occupancy expenses dropped commensurately from $1.13 billion in the 2009 first quarter to $1.0 billion in 2016's first quarter. This change comes even as the bank has significantly increased its core customer deposits (more on deposits later). Bank of America reported total net income of $4.2 billion in the 2009 first quarter. However, $1.43 billion of that was paid out as preferred stock dividends before common shareholders got a single penny. After accounting for the preferred dividends, net income attributable to common shareholders was just $2.8 billion. In the first quarter of 2016, however, preferred stock dividend payments were 68% less, just $457 million. That means a much higher percentage of net income was attributable to common shareholders -- $2.2 billion out of the reported $2.7 billion total. The process required for a large bank to declare a dividend is much more difficult today than it was in 2009 thanks to the stress testing and Federal Reserve review processes now required by the Dodd-Frank legislation. That said, a well-capitalized and profitable bank today is still able to pay a reasonable dividend to its shareholders. 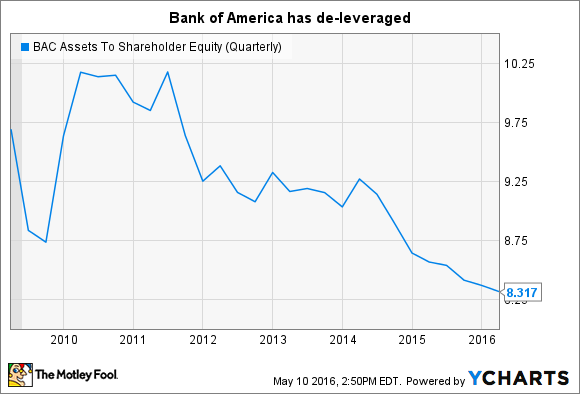 In 2009, Bank of America was not one of those well-capitalized and profitable banks, and paid a dividend of just $0.01 per share. While still less than that of some competitors, Bank of America currently pays an improved dividend of $0.05 per share. With any luck, the company will pass its 2016 stress tests with flying colors, clearing the path for an even larger dividend in the near future. As the financial crisis unfolded, the world realized how large, complex, interrelated, and unruly the financial derivatives market had become. The risk of holding a large, speculative portfolio of these contracts, everyone realized, was not worth the rewards they offered. On March 31, 2009, Bank of America reported total derivative assets of $137 billion, and on-balance sheet derivative liabilities of $76.6 billion. 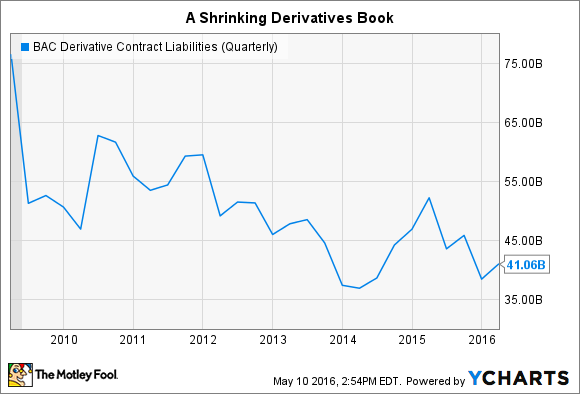 Since then, the bank has curtailed the use of derivatives, reducing derivative assets to $52 billion and on-balance sheet derivative liabilities to $41 billion. Despite the bank's smaller branch network, it has still managed to increase its total customer deposits from $954 billion to $1.217 trillion from the 2009 first quarter to the 2016 first quarter. This gain is a testament to the emergence of online and mobile banking, the bank's focus on its core consumer, business, and institutional customers, and the superb execution of Project New BAC's targeted cost cuts. This massive deposit base is a tremendous competitive advantage for Bank of America; its growth over this time should pay dividends for many years to come. 13. It gets better -- more of those deposits are free! Banks use customer deposits as a major source of funding, leveraging the relatively low cost to pay interest to depositors by investing that capital in higher yielding loans and debt securities. The interest paid on deposits is cheap right now, and as we observed above, that's a major positive for the bank. Of course, free deposits are even better than cheap ones, and Bank of America has significantly increased the level of interest-free deposits on its balance sheet. Since March 31, 2009, Bank of America has increased its non-interest bearing deposits (read: free funding sources) from $238 billion to $435.5 billion today. The downside of using high levels of customer deposits to fund investments is that it increases the leverage ratio of banks. If a typical bank today is leveraged at 10 times, that means that just a 10% decline in its assets could wipe out its entire equity base. After the crisis, regulators and policy makers appropriately decided that banks should carry a bit more capital than they had prior to the crisis. Today, all banks are required to carry higher capital levels, including Bank of America. Bank of America's tier 1 capital ratio has improved from 10.09% in 2009 to 13% as of quarter end on March 31 of this year. It's tier 1 leverage ratio is up from 7.07% to 8.7% over the same period. In its 2009 first quarter SEC filing, Bank of America explained a possible liability that could arise if the loans it originated did not meet certain criteria the bank guaranteed to its investors. The filing states that "under the corporation's representations and warranties, the Corporation may be required to either repurchase the mortgage loans with the identified defects or indemnify the investor or insurer. In such cases, the Corporation bears any subsequent credit loss on the mortgage loans." The bank didn't seem all that worried at the time, saying that "the Corporation's contractual liability arises only when the representations and warranties are breached. The Corporation attempts to limit its risk of incurring these losses by structuring its operations to ensure consistent production of quality mortgages and servicing those mortgages at levels that meet secondary mortgage market standards." Those attempts, as we now know, largely failed. Rep and warranty liabilities ultimately cost the bank $28 billion from 2008 to 2015. However, a court ruling last year upheld the bank's assertion that a statute of limitations should expire, freeing the bank of these liabilities going forward. In other words, Bank of America has at long last put one of the its last remaining crisis-era liabilities to bed. It's over, and that's a tremendous improvement. It's been a long and winding road for Bank of America since the financial crisis. Despite the ups and downs, the bank really has made great strides to improve itself since those dark days. Hopefully these changes will be enduring, both driving the bank to new highs and protecting it from the invariable recessions that will one day come.